Genome-wide association studies (GWAS) seek to identify genetic variants involved in specific traits. GWAS are advantageous for linking variants with traits, because they interrogate the genome in a uniform way. In other words, they examine the whole genome without a preconceived notion of where the associations may lie. However, we now know a lot about the putative function of genetic variants due to tremendous progress in functional genomics. In many cases, we even know which variants are more likely to be involved in disease when compared to others. Advancements in our understanding of functional genomics motivate the strategic incorporation of prior information in GWAS. Our group has been interested in this problem for many years. 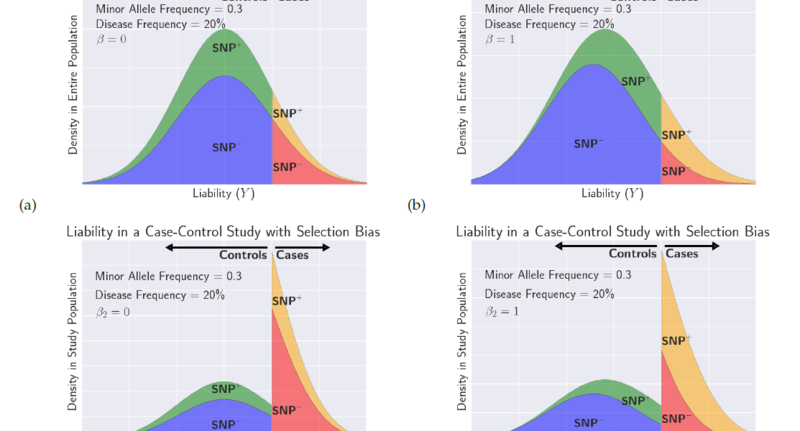 One challenge to addressing this problem is that the widely utilized approach for GWAS involves evaluating an association statistic at each single nucleotide polymorphism (SNP), and these methods take into account only one SNP at a time. The results are then adjusted for multiple testing, and an association is identified if a statistic exceeds a certain threshold. This approach can be described as a frequentist approach. On the other hand, one can incorporate prior information on which SNPs are likely to be the causal variants affecting the trait. This approach is inherently a Bayesian concept. Reconciling these two approaches is not straightforward. Average power under varying relative risks. For more information, see our paper. In a 2008 paper published in Genome Research, our group proposed a modification of the multiple testing framework to address this problem. Instead of using the same specific threshold for all of the association statistics, we use a different threshold for each association statistic, where the thresholds are adjusted based on the prior information. Our method takes advantage of the correlation structure by considering multiple markers within a region. In our paper, we demonstrate how to set the thresholds in order to optimally utilize prior information and maximize statistical power. Using prior information in genetic association studies increases power over traditional association studies while maintaining the same overall false-positive rate. Compared to standard methods, our approach is equally simple to apply to association studies, produces interpretable results as p-values, and is optimal in its use of prior information in regards to statistical power. In 2012, we extended this work to use only tag SNPs for the putative causal variant. This project was developed by Gregory Darnell (then UCLA undergraduate, now PhD student at Princeton University), Dat Duong (then UCLA undergraduate, now UCLA PhD student), and Buhm Han. More recently, we have applied this framework to incorporate functional information in analysis of eQTL data. In this case, incorporating genomic annotation of variants significantly increases the statistical power of existing eQTL methods and detects more eGenes in comparison to standard approaches. Read the blog post on this paper, and download the full article. In addition, the open source implementation of our 2012 paper, MASA, which was developed by Greg Darnell and Dat Duong, is freely available for download at http://masa.cs.ucla.edu/. In: Bioinformatics, 28 (12), pp. i147-i153, 2012, ISSN: 1367-4811. SUMMARY: Recent technological developments in measuring genetic variation have ushered in an era of genome-wide association studies which have discovered many genes involved in human disease. Current methods to perform association studies collect genetic information and compare the frequency of variants in individuals with and without the disease. Standard approaches do not take into account any information on whether or not a given variant is likely to have an effect on the disease. We propose a novel method for computing an association statistic which takes into account prior information. Our method improves both power and resolution by 8% and 27%, respectively, over traditional methods for performing association studies when applied to simulations using the HapMap data. Advantages of our method are that it is as simple to apply to association studies as standard methods, the results of the method are interpretable as the method reports p-values, and the method is optimal in its use of prior information in regards to statistical power. AVAILABILITY: The method presented herein is available at http://masa.cs.ucla.edu CONTACT: eeskin@cs.ucla.edu. Structure and Molecular Function as Prior Information.” Genome Research. in Computational Biology (RECOMB-2008), 2008. Michael Bilow and Eleazar Eskin, together with Fernando Crespo, Zhicheng Pan, and Susana Eyheramendy, recently released a novel method for accurate joint modeling of clinical phenotype and disease status. This approach incorporates a clinical phenotype into case/control studies under the assumption that the genetic variant can affect both. Genetic case-control association studies have found thousands of associations between genetic variants and disease. Most studies collect data from individuals with and without disease, and they often search for variants with different frequencies between the groups. Jointly modelling clinical phenotype and disease status is a promising way to increase power to detect true associations between genetics and disease. In particular, this method increases potential for discovering genetic variants that are associated with both a clinical phenotype and a disease. However, standard multivariate techniques fail to effectively solve this problem because their case-control status is discrete and not continuous. Standard approaches to estimate model parameters are biased due to the ascertainment in case/control studies. We present a novel method that resolves both of these issues for simultaneous association testing of genetic variants that have both case status and a clinical covariate. In our paper, we show the utility of our method using data from the North Finland Birth Cohort (NFBC) dataset. NFBC enrolled almost everyone born in 1966 in Finland’s two most northern provinces. The NFBC dataset consists of 10 phenotypes and genotypes at 331,476 genetic variants measured in 5,327 individuals. We focus our study on the LDL cholesterol and triglyceride levels phenotypes. Our evaluation strategy analyzes a subset of the NFBC data and compares what we discover here to what was discovered in the full NFBC dataset—which we treat as the gold standard. 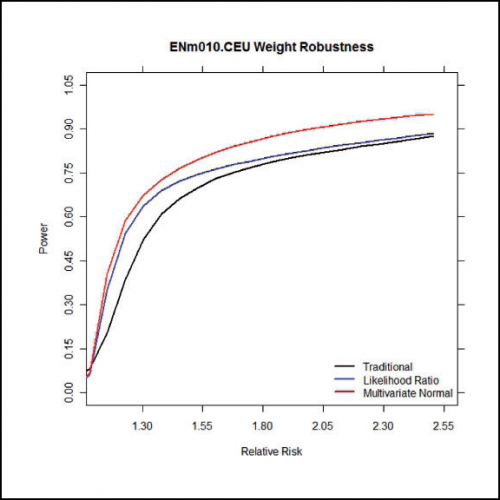 We compare the performance of our novel approach to three other methods: (1) the single univariate test applied to the disease status, (2) the multivariate approach applied to the disease status and the clinical phenotype modeled as a multivariate normal distribution, and (3) the liability threshold model treating the clinical phenotype as a covariate. Using the univariate approach, the p-values are much weaker in comparison to those observed in the full NFBC dataset. Running the multivariate approaches, incorporating the triglyceride levels phenotypes, increased power (i.e., more significant p-values than SNPs). Our method has the highest power in all scenarios. The advantage of our method is greater when there are substantial amounts of selection bias compared to lower amounts of selection bias. Our method is even more powerful when the correlation between the clinical covariate and the disease liability is lower, because we explicitly estimate the underlying liability using all of the data. 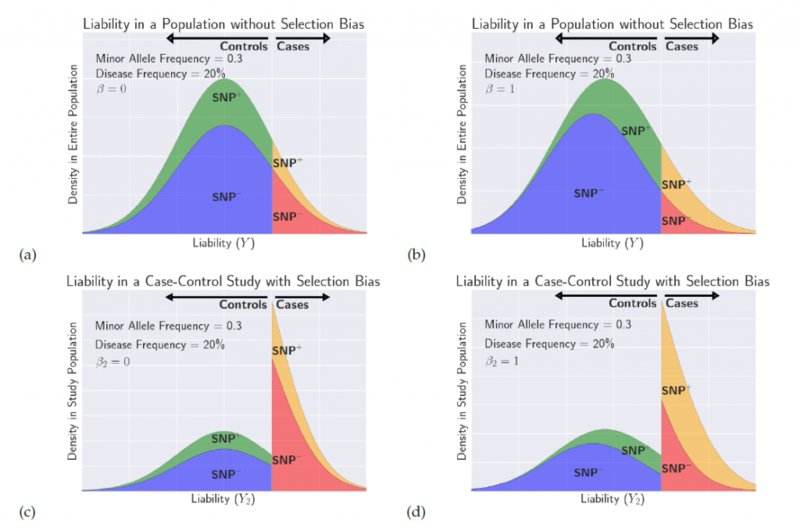 An illustration of the distribution of liability in a case-control study under selection bias. For more information, read our paper. Bilow, M., Crespo, F., Pan, Z., Eskin, E. and Eyheramendy, S., 2017. 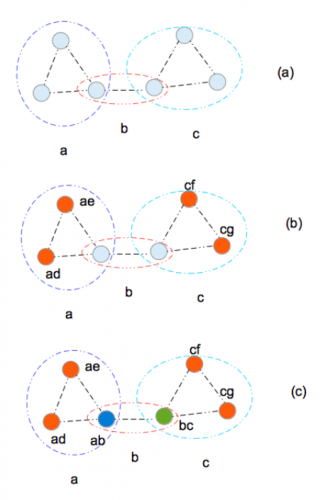 Simultaneous Modeling of Disease Status and Clinical Phenotypes to Increase Power in GWAS. Genetics, pp.genetics-116.